The story of the Annunciation is one of the most frequent themes in Christian art, most notably depicted by the artists of the Middle Ages and Renaissance. This is a story of connection between humanity and infinity, between the known and the unknown – of miracles, birth, and redemption. Is it any wonder that artists such as Sandro Botticelli, Leonardo da Vinci, Caravaggio and many, many others endeavoured to give life to this event through their artwork? These past weeks of exploring this artistic expression has opened my eyes to the breadth of this subject matter. An artist’s interpretation of an event is captured in the facial expressions, the hand positions, symbolism, length of brushstrokes, colours, backgrounds – all combine to allow the viewer to experience a oneness with the artist that breaks down the barriers of time and location. And speaking of locations, paintings have personal journeys and destinations. Once created, they take on a life of their own and can no longer be held by the artist. While they may be owned by collectors for a time, they move from home to home, country to country, crossing oceans and mountains. 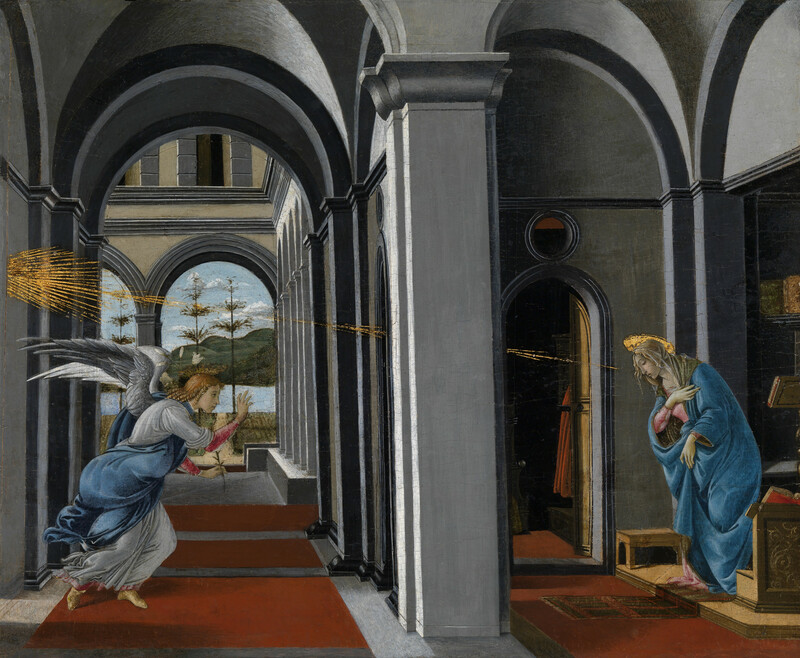 The Annunciation by Sandro Botticelli was painted in Florence, Italy circa 1490-1495. It is now housed at the Kelvingrove Art Gallery and Museum, Glasgow Scotland, bequeathed by Archibald McLellan in 1854. Born in 1795, McLellan was a coachbuilder, art collector, councillor and magistrate – emphasis on the art collector. When he died in 1854, Archibald McLellan’s staggering debts forced his heirs to put his entire collection up for sale. The Glasgow town council had the foresight to purchase the entire collection. 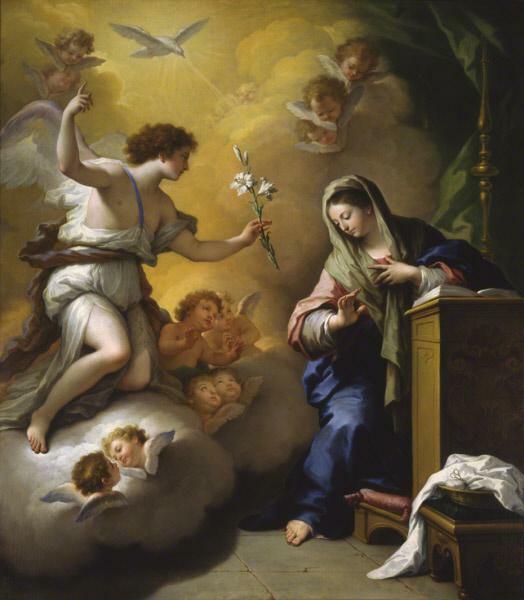 The Annunciation by Paolo de Matteis was created in Naples, Italy in 1712 for Aurora Sanseverino, Duchess of Laurenzano. The painting found its way into the collection of Prince Henry of Bourbon-Parma, Count of Bardi (1851-1905), Parma, Italy. Upon his death, the painting was sold to Hirschler and Company, Vienna, Austria. In 1973, the Heim Gallery, in London England gained possession and sold it thereafter to Saint Louis Art Museum. 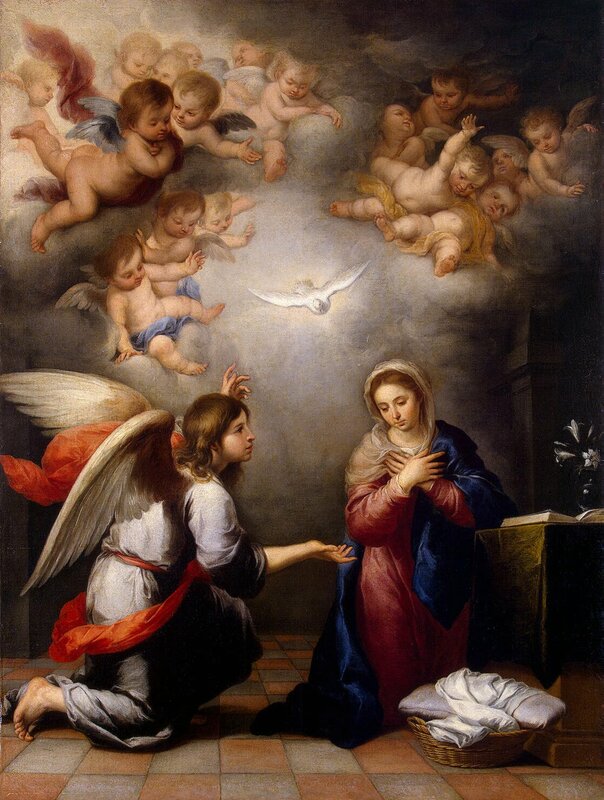 The Annunciation by Bartolomé Esteban Murillo was created in Seville, Spain during the years 1655 – 1660. The painting has found its home at the Hermitage Museum, St. Petersburg. The Hermitage purchased the painting from the collector, W. Coesvelt of Amsterdam. What was created in Seville, Florence and Naples have made their way to distant lands. Wherever they went, they brought their narrative with them. Whether they remain in the places they now reside – well, that is another story for another generation to discover. Rebecca, this post is perfect for the season. I’m not a walking encyclopedia of art, but I do know certain works, like the ones you show and discuss here. That is due to my Catholic (no longer practice) upbringing. Many paintings of Gabriel, announcing the coming of baby Jesus to Mary, were shown to us. Thank you for this wonderful post full of history! What a precious, beautiful, educational, vibrant and well-composed essay. I treasure the time, information, words, and love that went into this article. A wonderful story and history of artists that deserve discovery. Thank you! ! I always look forward to your great posts! I am always delighted when you join my explorations into the world of art. The story of Saint Emedius is well known. According to legend, he was beheaded by Polymius. But that is not the end of the story. Saint Emedius rose up, carried his own head to the spot on a mount where he had constructed an oratory. In 1703, the region of Marche, Italy experienced a terrible earthquake. Ascoli Piceno was not affected, which was directly attributed to Saint Emedius’s intervention. After the earthquake, many towns in Marche appointed Saint Emedius as their patron. A gorgeous collection, Becky, thank you. I must try to get across to the Kelvingrove Museum to have a look at that lovely Boticelli painting. Oh Liz! I love the Kelvingrove Museum. I especially enjoyed the Margaret Macdonald collection. And the Glasgow Boys too. Well – all it it. Especially the Haggis Scoticus specimen on display. I have enjoyed this research project. The next iteration is the Pre-Raphaelites. I enjoy “chasing” art. There is always, always an adventure! I think the Glasgow Boys exhibition might have been the last time I was there. So another visit is long overdue…! The artists that came together during a time of industrial strength, added balance, with their creative genius, to a world in dramatic transformation. Just as the Inkings gave us the literature. Alas, I never made it to the Birmingham Museum! But now I can stop by virtually. Thank you for the link – a good place to begin my exploration. “This is a story of connection between humanity and infinity, between the known and the unknown – of miracles, birth, and redemption.” This is beautiful and epitomizes the too familiar, but sacred, Christmas story. The Annunciation, the Visitation and Magnificat, and the Nativity complete the triad of uplifting stories, and artwork, for Christianity’s most revered woman. The story of Elizabeth and Mary is especially wonderful. Merry Christmas again, Rebecca! I wonder if the artists had any idea that their works might travel, or even last for so long. That is a very good question. The other question I have is whether collectors understand that creativity cannot be held indefinitely. In the end, art belongs to everyone because it holds ideas. And ideas, as you know, can sweep around the world within hours, even minutes in our technological world. What I found most interesting is the name W. Coesvelt of Amsterdam. The Hermitage Museum in St. Petersburg has many painting attributed to W. Coesvelt, but I can’t find anything about this collector on a Google search. So many stories hidden in the folds of history. It seems to me a trip to the Hermitage Museum would be in order. Is that a possibility? Perhaps you have already been. I was there a few years ago. It is truly amazing – it would take years to explore this remarkable collection. What I have found out during researching this post is that you can visit the Hermitage museum virtually, another gift of our technological world. Many paintings/artwork remains in storage until it comes on display – the benefit of the virtual visit is that what is in storage is captured in digital format. So yes, you and I can visit the Hermitage together!!! Hugs! Frieden könnte eine Botschaft sein! Ich stimme voll und ganz zu. Eine wunderbare Botschaft für unsere Welt.